The Girls of Riyadh, by Rajaa Alsanea. 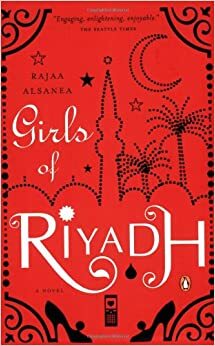 The Girls of Riyadh, by Rajaa Alsanea. Penguin Books (2008), Edition: Reprint, 286 pages. (First published in Arabic in 2005.) Translated by Marilyn Booth. A controversial, but shallow novel by a young woman from Saudi Arabia about the love lives of small cluster of very privileged women friends. Rajaa Alsanea was born in Riyadh in 1981 and grew up in a medical family there. When she was 18, she wrote Girls of Riyadh which was first published in Lebanon in 2005. The book is structured as the email account of a young Saudi girl who blogs weekly accounts, read primarily by men, of the romantic adventures of four teenage girls. The book caused an uproar in Saudi Arabia with citizens suing to have it banned in the country because they claimed it did not promote national and religious values and practices. In 2007, the court ruled that the book should not be banned. The following year, it was published in English. Alsanea came to the United States to attend graduate school in dentistry after the book was published. For non-Arab readers, it is hard to see The Girls of Riyadh as radical. In fact, the girls in the book act in ways typical for young women in other parts of the world. In Saudi Arabia, however, it is illegal and immoral for unmarried women to associate with any men not their relatives, as the girls in this book do consistently. In one instance, a bride even “gives herself” to her groom while they are still in the midst of the lengthy marriage rituals. (He divorces her for doing it.) Leaders in Saudi Arabia expressed fear that the book would inspire other young women to follow the examples described in it. Arab readers also took the author to task for her mixture of classic Arab with internet slang. Perhaps equally damning was the extremely negative portrayal of Saudi men who regularly treat women they claim to love with cruelty. Each of the four girls is heartbroken after putting their trust in a man who ultimately rejects her. My reasons for disliking the book have a different basis. The friends are all from “the velvet class.” They are extremely wealthy and devoted their time primarily to designer clothes, make-up, lavish parties, and, despite the restriction under which they live, chasing men. Sometime they go to college or take jobs, but such activities are incidental to finding the right man. Their chief guide in this endeavor is a book about the compatibility of couples born under different signs of the zodiac. One woman laments that she doesn’t support a political cause, because that would distract her from her heart-break. None of the women are grounded in traditional culture and religion or in individualistic “western” values. In the style of romance genre, each of them assumes that life fulfillment lies in the hands of a husband. At the book’s end the women come together to create a wedding planning business which imports European chocolates. I found it difficult to identify or even respect these women. The Girls of Riyadh provides an interesting view of restricted options for women in Saudi Arabia, the most restrictive for women in the Gulf States. Other books tell the same story with more clarity and less celebration of wealth. For example, for Saudi women, see Daring to Drive, Manal al’Sharif, and Excellent Daughters, Katherine Zoepf. For more general discussion of contemporary Islamic women, see The Quiet Revolution, Leila Ahmed. Thank you for your review. I always find your words inspiring and today, as I am from Saudi , wasinterested to read your review on this novel. The book is not recognised or celebrated back home, I know it is banned but after all the banning is symbolic, every one can read on line. But the novel gains popularity in the West and other countries because the publishers and their marketting agendas foynd it ‘controversial’. Many other Saudi novelists gain popularity in the country by writing romance, which like Alsani’s, capturing men as idols. I am tired of this mindset. If you read for male authors from Saudi you may be astonished by the rooted misogyny. I wonder why some authors reflect the traces of social pressure rather than confronting them. Thank you for your response. I always appreciate the views of those of you who know more about the subject of a book than I do. Yes, there might have been a better word than controversial, but I assumed that any book that was banned was controverial. Have you read the other books I mentioned? Do they give any more accurate a picture? I was astonished by the misogyny I saw second hand in these books. I am not sure how I would confront a situation like the one described if I had to live with it.